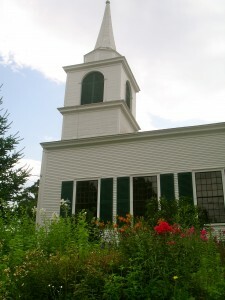 Also known as the Tory Hill Meetinghouse, the First Congregational Church of Buxton is a warm and welcoming congregation, open and accepting of all people. We are a community of Christians who gather for worship, Bible study, social events, and outreach to Buxton and the wider community. We are passionate about mission, prayer, exploring God’s word together, and expressing our joy in God’s love. At one of our annual meetings, when we talked animatedly about who we are as a church, one member said, with great fondness, that he sees us as folks who don’t easily “fit in” in other church settings – a congregation of “misfits,” perhaps. Our differences keep us humble, someone else added, and having different viewpoints makes us stronger. Sunday morning worship services are at 10:30 AM. We gather at the Meetinghouse near the intersection of Routes 112 and 202 in Buxton, Maine. Our worship services are Bible-based, lively and often interactive. Our pick-up choir, while small in number, is great in spirit, talent and enthusiasm. Rehearsals are at 9:45 AM before church on Sundays, with summers off. Children are a welcome and active part of our worship at Tory Hill, with Sunday School incorporated in the morning worship service. See our Christian Education page for further details. The Tory Hill church is part of the United Church of Christ, a denomination known throughout its various historical strands as a church that takes courageous stands for peace, justice and inclusivity. This church has a long history in the Buxton community, beginning with the first church building erected in 1762. The current church was built in 1822 and retains its 19th century beauty and simplicity. It is the setting for a Kate Douglas Wiggin play called “The Old Peabody Pew,” which is presented each year in December. We invite you to join us, and experience this warmth for yourself and the feeling of being at home. It is God’s welcome that awaits you.